Barbie continues her march toward the dustbin of cultural history, sure, but that doesn't mean there's no more cash to be made off your childhood. For instance: A company is betting it can revitalize '80s mainstay Strawberry Shortcake, of all things. The New York Post reports that Iconix Brands is buying the rights to the character from American Greetings, for $105 million. The company, which already owns a big chunk of Peanuts, has previously lavished its efforts on revamping Candies and Joe Boxer and is purchasing PONY, as well. 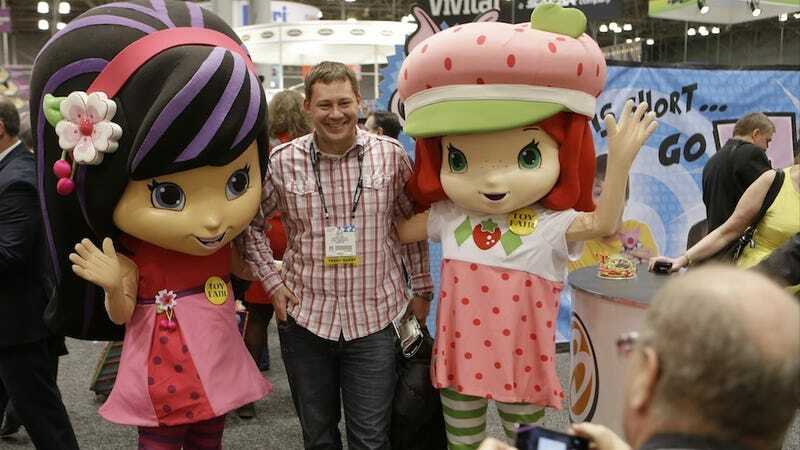 So the plan is to make Strawberry Shortcake relevant again: "We see many opportunities to grow this brand worldwide, and believe Strawberry Shortcake has a fresh fashion appeal that can play to both classic and modern tastes," said managing director Leigh Anne Brodsky. So her owner, American Greetings Properties, worked for a year on what it calls a "fruit-forward" makeover. Strawberry Shortcake, part of a line of scented dolls, now prefers fresh fruit to gumdrops, appears to wear just a dab of lipstick (but no rouge), and spends her time chatting on a cellphone instead of brushing her calico cat, Custard. Did I mention style blogger? Like with a really popular Instagram? Kids love Instagram. Of course, they will probably make her a pop star. Can't have too many pop stars.